As an administrator, you can set usage limits for crucial resources like SVMs, SVM hours, and storage. For a description of these types of usage, see How usage is calculated. Skytap monitors four types of usage: storage The amount of data storage space used by assets, environments, and templates. At the account level, this also includes the storage space used by any regional shared drives. , SVM hours A unit of measurement that corresponds to the total number of hours that your account has run VMs, translated into their SVM equivalents. 1 SVM hour is equivalent to 1 SVM running for 1 hour. To learn more, see How usage is calculated. , concurrent VMs The number of virtual machines running simultaneously. To learn more, see How usage is calculated. , and concurrent SVMs The number of Skytap Virtual Machines (SVMs) running simultaneously. To learn more, see How usage is calculated. . If Power A particular type of CPU that supports IBM i, AIX, and Linux in Skytap Cloud. VMs are enabled for your account, SVM hours and concurrent SVMs are tracked separately for x86 The most common type of CPU for Windows and Linux VMs in Skytap Cloud. and Power VMs. These limits control usage associated with the environments, templates, and assets that a specific user owns. If an environment is shared with multiple users, usage is tracked against the environment owner. For example, if Jim runs a VM in an environment that Mary owns, the concurrent VMs, concurrent SVMs and SVM hours are tracked against Mary’s user limits, not Jim’s. The storage usage for the environment is also tracked against Mary’s user limit. For instructions, see Setting usage limits for users. These limits control the usage associated with the environments, templates, and assets owned by all of the users in a department. For instructions, see Setting department usage limits. These limits control the maximum concurrent SVMs and storage usage consumed by the environments, templates, assets, and shared drive in a specific region. If your account does not have regional limits, concurrent SVMs and storage are instead controlled at the account-wide, global level. For instructions, see Setting global and regional limits. These limits control the cumulative SVM hours and maximum concurrent VMs for all environments in the account. When a user is subject to multiple limits for the same type of usage (for example, a regional storage limit, a department storage limit, and a user storage limit), the user’s usage is halted when any of those limits are met. For example, if the regional storage limit has been met, then users cannot create any more resources in that region, even if they have remaining usage left in their department and user limits. Mary will not be able to exceed her limit of 25 GB, even though her department allows up to 250 GB. If Mary has a special need, the administrator may remove her user storage limit, which would let her use all 250 GB of the department’s storage. While Mary is using all of the department’s storage, no one else in the department can use any storage, even if their individual limits haven’t been met. 750 GB remains reserved for use by other departments. To guarantee all the users in a department have access to resources, set the limits of all other departments and user accounts such that the sum total of their limits is below the overall company limit. This creates a gap between their combined limits and the company limits that ensures that resources are available for your department. SVM Hours – All running VMs are suspended. You can’t use more SVM Hours unless you increase the user, department, or account limit. SVM or VM limit – No more VMs can be started. Stop running VMs to release SVMs and VMs and allow more to be started. Storage – No more templates or environments may be created. Delete templates or environments to allow more to be created. You must be an administrator or user manager to edit user limits. User managers cannot edit limits for an administrator’s account. Navigate to Admin > Users. Click (Edit User Limits) next to the user you want to edit. 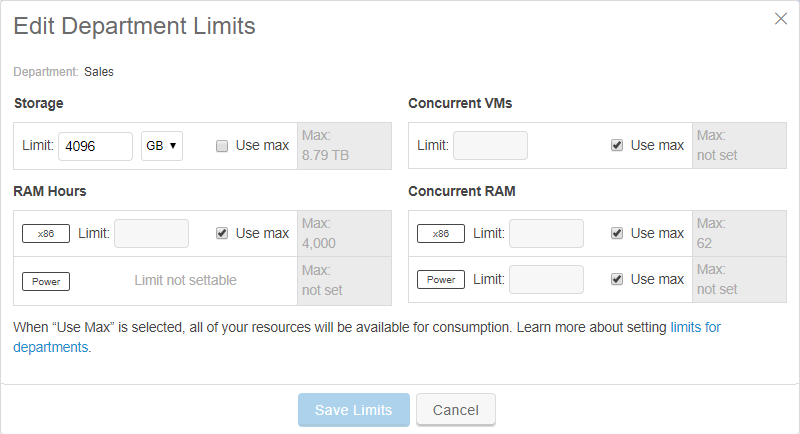 In the Edit User Limits window, enter a Storage (in GB), SVM hours, Concurrent VMs, and/or Concurrent SVMs limit. To set no limit, select Use max. When Use max is selected, the user can use up to the account limit for the billing period. The user’s department limit (if applicable) is displayed in the Max: field. If Power VMs are enabled for your account, you set Concurrent SVM limits for x86 and Power individually. A user’s limit can be set higher than the department, regional, or account limit. The sum of all user limits does not need to equal the department, regional, or company limit. However, the user’s actual usage can’t exceed the department, regional, or company limit. On the Users page, click Select. Select the users you want to edit. Click Edit limits. The Edit User Limits window displays. 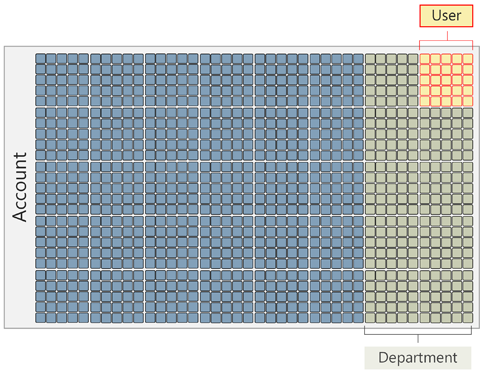 Administrators can also track and control usage on a departmental basis. Click (Edit limit) next to the department you want to edit. In the Edit Department Limits window, enter a Storage (in GB), SVM hours, Concurrent VMs, and/or Concurrent SVMs limit. To set no limit, select Use max. When Use max is selected, the department can use up to the account limit for the billing period; the account limit is displayed in the Max: field. Navigate to the Admin > Current Usage page. In the Current Usage: Global section, click the value next to Burst. The SVM Hours dialog displays. Type a value for Limit, which is the total usage limit available when burst is enabled. The value for Limit A hard cap placed on a user, department, or customer account usage of storage, SVM hours, concurrent SVMs, and concurrent VMs. Limits may apply to global usage or to usage in a particular region. To learn more, see Usage limits overview. must be between the Subscription The global or regional limit for concurrent SVMs, SVM hours, storage (GB), networks, and public IP addresses defined in your contract. 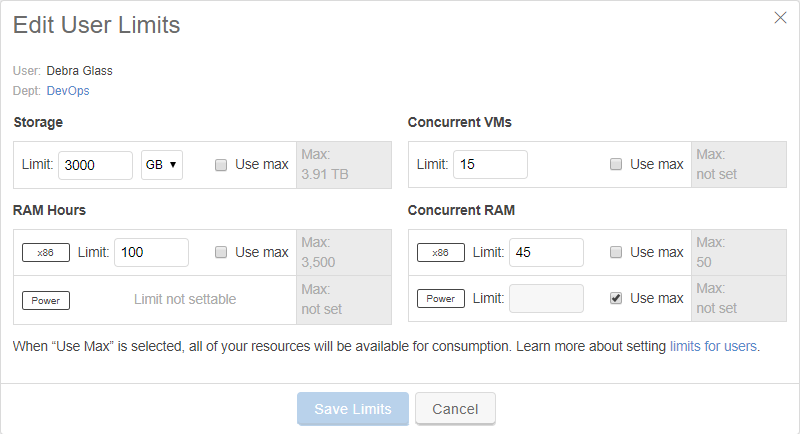 You can exceed your account subscription by setting a higher limit for max concurrent SVMs, SVM hours, and storage usage. You are charged a premium for this additional usage. limit and the Max settable limit The highest usage limit that you can set for your account. To increase this value, contact support. .
By setting a limit that is higher than your subscription, you can enable bursting, which allows your users to work on business-critical projects even after you exceed your expected billing rate. For more information about limits and bursting, see Understanding bursting. In the Current Usage: Regional section for the region you want to edit, click the value next to Burst. Navigate to the Admin > Settings page. In the Account-wide limits section, click the blue, underlined value in the Limit column and enter a new value. By setting a limit that is higher than your subscription, you can enable “bursting”, which allows your users to work on business-critical projects even after you exceed your expected billing rate. For more information about the values on this page, see Account-wide usage limits.